Most day camps have no problem distracting kids for a few hours each day. But that’s all they’re doing, filling a kid’s time until the parent picks them up. But the fact is, those kids aren’t really learning anything while they’re at summer camp. 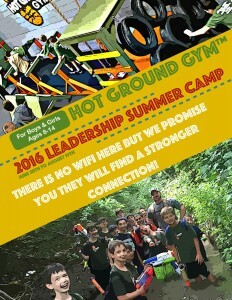 That’s where the Hot Ground Gym 2016 Leadership Summer Camp comes in. We don’t want to just entertain the kids; we want them to leave having skills that they didn’t have when they arrived. Here are some of the advantages to our kids summer camp in Northbrook. Leadership and Teamwork: At points during their time at our day camp, each child will be in both a leadership role and as a supporting team member. This exercises social muscles that they might never have used before, and builds skills that they’ll be able to use their entire lives. Survival Skills and First Aid: We’re not going to drop you kids off in the middle of the woods and have them fight bears for three days. But we might tell them the best ways to survive if you’re ever lost in the woods, and simple first aid teachings so that they know the best way to help them (or a friend) with a broken arm. Who couldn’t use some basic training? Our summer camp is here to give kids some skills that they can use for a lifetime. Want to learn more, or ready to sign up? Find more information and the sign-up sheet right here.